It’s the end of a long European vacation. As you’ve gallivanted throughout the world, one layover is standing between yourself and your comfy bed awaiting at home. As luck would have it, the layover takes you to Rome. We’re going to assume you’ve never previously had the pleasure of traversing down the ancient streets of The Eternal City. The history within the metropolis is quite vast. However, there are plenty of modern attractions available to whet the most insatiable of appetites. Your train/flight will get into Rome during the early portion of the morning. At this point, grab a quick snack — whether it be a pastry or a coffee. You’ll certainly be eating your weight in food later during the day. “Looking” like an obvious tourist is something most Americans want to avoid (Hint: Avoid wearing baggy sweatshirts with sports logos or college names on the front). With that said, there are those times where participating in touristy things are inevitable. With the limited amount of time you’ve got, jumping on one of those gigantic double-decker red tour buses is your best bet at packing in as much in the way of sights as possible. I know, I know…riding the red bus doesn’t sound overly fun. However, it’s the most efficient mode of transportation. It also is a nice reprieve if a brigade of blisters have set up shop on the bottoms of your feet. By paying roughly $30, you’ll be taken to every major site within the city. Each ticket comes with a headset. Pipped in voice-overs will give you facts and a run-down of every single building along the way. This is a hop-on/hop-off tour. If you want to spend extra time checking out one of the major attractions, you’re able to get off the bus and explore. Every 15 minutes or so, another bus will drive to the pick-up/drop-off designated area. In essence, the loop continues virtually all day. There are 8 major stops throughout the loop. These include famed locations such as Vatican City, the Colosseum, and the Trevi Fountain. No, Joaquin Phoenix and a hoard of lions aren’t roaming the grounds, but getting out and seeing the Colosseum first-hand is an absolute must. For a fee, tour guides will take you inside the structure with a personally guided tour. As many do, you can also take in its majesty from outside the Colosseum for absolutely nothing. The same can be said for the Trevi Fountain (make sure you have a coin ready to toss over your shoulder). It can be a bit crowded during the evening, though during the day it’s more accessible to enjoy. Now, there will be people (often rudely) coming up to you in order to sell tickets for the Vatican Museum. Often times, the ‘no waiting in line’ perk is offered — as is the admittance to the Sistine Chapel and St. Peter’s Basilica. It’s an acceptable practice to haggle when it comes to price. For a guided tour ticket into both the Vatican Museum and the Sistine Chapel, settle around the price tag of 35-to-40 euros ($43-$50). Regardless of religious affiliation, taking in the Vatican is a truly mind-boggling experience. The regal and opulent architecture is not only historical — but also phenomenal. The tour will likely run around 1.5-to-2 hours (keep that in mind as you plan the remainder of your day). At this point, you’ve spent the majority of your afternoon seeing the sights. It’s now time to eat. After all, you are in Italy. We’re not talking about grabbing McDonald’s or some sort of quick food. You want to have a truly authentic experience here before you head back to the states and subject yourself to Pizza Hut, Buca di Beppo, and Olive Garden. 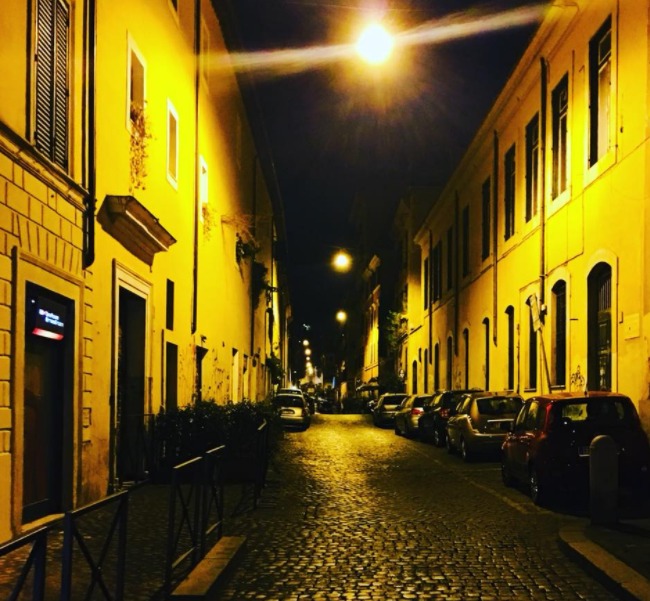 Regardless of where you’re staying in Rome, head to the Trastevere neighborhood at night. Restaurants in the super touristy areas will be much more expensive comparatively speaking to the rest of Rome. Besides that, the food won’t be nearly as good. Trastevere is a gritty neighborhood cloaked in charm and energy. Though it’s primarily considered a working-class area, the neighborhood is chock-full of young, vibrant people. There are countless hole-in-the-wall restaurants providing you with truly great food at a cheap price. The best restaurant to quench your ‘authentic Italian meal needs’ would be Ai Spaghettari. A staple within both Trastevere and Rome, the restaurant has been in business since 1896. A (sizable) personal pizza will cost less than $10. 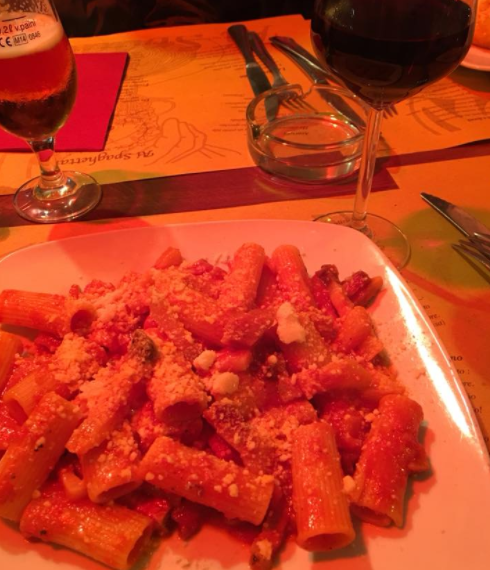 Duly, you’ll want to try two of Rome’s hallmark pasta dishes: Cacio e pepe and rigatoni with amatriciana. After polishing off the delicious dishes (and a bottle of wine or two), you’ll want to keep the party going. Walking down the cobblestone streets just a short distance from the restaurant, you’ll find yourself in the famed Piazza di San Calisto. On most nights, dozens of people will be standing outside enjoying the atmosphere with a beverage. Inside the popular bar — ironically enough named ‘Bar’ — a small, old guy resembling your grandfather takes orders before you go to pick up your drink. There’s a method to this, as you pay him before taking a ticket up to the bartender across the room. If this process isn’t followed, you’ll likely be yelled at in Italian. From there you’ll get judgmental looks from the natives. You certainly don’t want this to happen. There’s a level of palpable energy within this part of the city. It’s seemingly always buzzing, which makes for enjoying an after-dinner drink that much better. The ancient architecture allows for you to be transported back in time — though modern conveniences in the way of bars, clubs, and eateries are also clearly present. 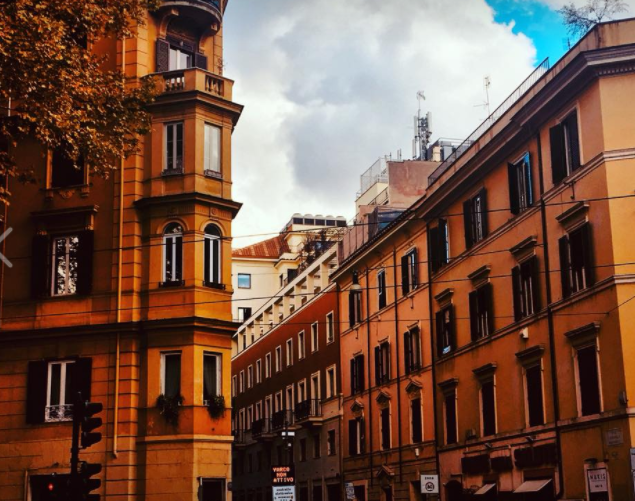 You’ll want to head back to Rome for a lengthier trip. The history surrounding this metropolis is phenomenal — as is the amount of avenues one can pursue whilst within the city limits. With that said, this short visit will allow you to get a nice initial taste of the city and all that it has to offer.